Survivor: The Australian Outback (2001) - 6th place, 11th out - 4th juror. Voted out in Episode 11, "No Longer Just a Game" (Day 33). Survivor: All-Stars (2004) - Winner, 4-3. 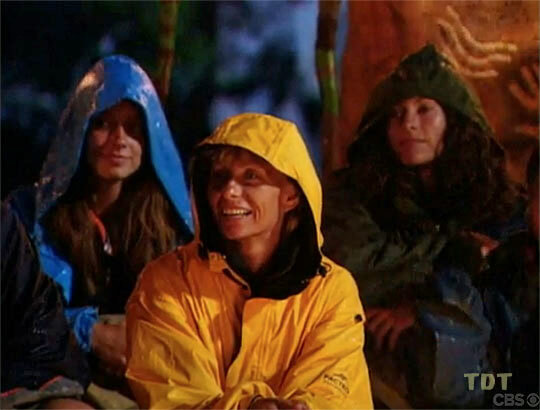 Received four jury votes, to win (4-3) in Episode 15, "The Sole Surviving All-Star" (Day 39). The Australian Outback Ep. 1 RC/IC: "Bridging the Gap" - thanks to a capsizing Kucha raft, Ogakor wins easily. The Australian Outback Ep. 2 RC: "Butch Cassidy" - First to jump, Ogakor wins again. The Australian Outback Ep. 2 IC: "Tucker'd Out" - Successfully eats mud whelk, but thanks to Tina, Ogakor loses. The Australian Outback Ep. 3 RC: "Water Torture" - Carries water, and Ogakor wins in the tie-breaker. The Australian Outback Ep. 3 IC: "Lock Step" - Runs well with Ogakor, but thanks to Maralyn's repeated trips, Ogakor loses. The Australian Outback Ep. 4 RC: "Master Mind" - Participates in the puzzle, Ogakor loses. The Australian Outback Ep. 4 IC: "True or Falls" - Answers a question correctly, but Ogakor loses. The Australian Outback Ep. 5 RC: "Triage" - Ogakor loses its fourth straight. The Australian Outback Ep. 5 IC: "The Maze" - Somehow, Ogakor wins. The Australian Outback Ep. 6 RC: "Blind Leading the Blind" - Ogakor loses, depriving Tina of Doritos. The Australian Outback Ep. 9 RC: "Double Play" - Paired with Keith, makes final round, but loses to Colby/Jerri. The Australian Outback Ep. 7 IC: "Perch" - Lasts an impressive 6 hrs, 47 minutes; eventually gives up (with Jerri) for ice cream and chocolate (5th/10). The Australian Outback Ep. 8 RC: "Return to Sender" - Narrowly loses to Jerri, but shares reward (2nd/9). The Australian Outback Ep. 8 IC: "Don't Fence Me In" - Drops 10 discs, good enough for third place (3rd/9). The Australian Outback Ep. 9 IC: "Hanging in the Balance" - Beats Elisabeth in the first round, loses to Nick in the second round (tie-3rd/8). The Australian Outback Ep. 10 IC: "Fire and Water" - not among the leaders (bottom 5/7). The Australian Outback Ep. 11 RC: "End of the Line" - finishes second (2nd/6). The Australian Outback Ep. 11 IC: "Blue Plate Special" - first person eliminated (6th/6). All-Stars Ep. 1 RC/IC: "Quest for Fire" - Chapera wins (1st/3). All-Stars Ep. 2 RC: "Stairway to the Stars" - Chapera does not win, but Saboga gives them reward, anyway. All-Stars Ep. 2 IC: "Float Your Boat" - Chapera wins again (1st/3). All-Stars Ep. 3 RC: "Better Homes and Island Living" - With Sue, sits out of another Chapera win (1st/3). All-Stars Ep. 4 RC: "Match Maker" - Chapera wins again (1st/3). All-Stars Ep. 4 IC: "Blind Leading the Blind" - Sits out, and somehow, Chapera actually finishes third (3rd/3). All-Stars Ep. 5 RC: "Shipwrecked Raft Rescue" - Chapera finishes second, still gets decent Sabogas when they're dissolved (2nd*/3). All-Stars Ep. 5 IC: "Pilfering Pirates" - Now down to two tribes, Chapera wins. All-Stars Ep. 6 RC: "Tribal Stomp-ede" - Chapera loses Sue to a quit, then loses the challenge. All-Stars Ep. 7 RC/IC: "Blind Leading the Blind" - Chapera wins again. All-Stars Ep. 8 RC: "Log Jam" - Beats Jerri, then Kathy for the final point; Chapera wins again, 5-3. All-Stars Ep. 8 IC: "Choose Your Weapon" - Chapera wins. All-Stars Ep. 9 IC: "Survivor History" - Re-switched to Chapera, which promptly loses. All-Stars Ep. 11 RC: "Big Bad O' Course" - part of the winning team, with Rob, Alicia, and Shii Ann. All-Stars Ep. 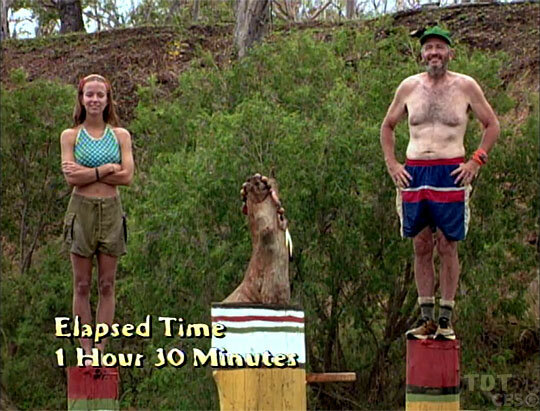 10 RC: "Rock Bottom" - Eliminated in 2nd round, Rupert picks her & Jenna to join the trip (tie-6th/9). All-Stars Ep. 10 IC: "Waiting to Exhale" - Makes the final round for women, but loses to Kathy (2nd/4). All-Stars Ep. 11 IC: "Big Bad O' Course" - does not win the individual immunity portion. All-Stars Ep. 12 RC: "Face Off" - last person eliminated (2nd/7). All-Stars Ep. 12 IC: "When It Rains, It Pours" - First person out, almost immediately (7th/7). [All-Stars Ep. 13 RC: "Survivor Smorgasboard" - Amber's mom is out in the 1st round (6th/6; not counted)]. All-Stars Ep. 13 IC: "Fire and Rain" - Runs out of matches, does not win (5th/6). All-Stars Ep. 14 RC: "Second Chance" - Makes it to the final round, but loses to Rob, who chooses to bring her along. Amber receives a free car for her troubles (2nd/5). All-Stars Ep. 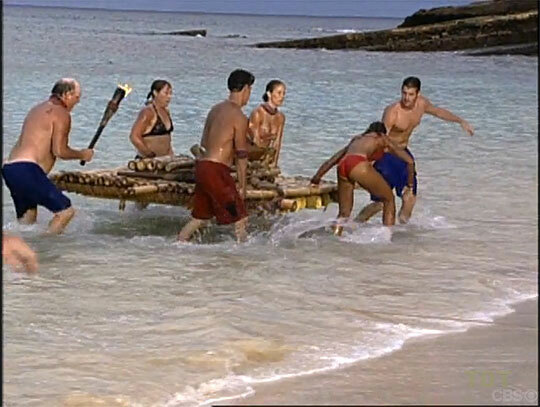 14 IC: "Survivor Scramble" - Amber is first to 17 tribe names, but can't unscramble the letters to get CHABOGA MOGO, gets passed by and narrowly loses to Rob (2nd/5). All-Stars Ep. 15 F3 IC: "Hand On a Hard Idol" - Tries to convince Rob to let her win, accidentally loses (2nd/3). The Australian Outback, Ep. 2: Kel Gleason (voted out, 7-1). The Australian Outback, Ep. 3: Maralyn Hershey (voted out, 5-1-1). The Australian Outback, Ep. 7: Jeff Varner (voted out, 5-5 [eliminated based on prior votes against]). The Australian Outback, Ep. 8: Alicia Calaway (voted out, 5-4). The Australian Outback, Ep. 10: Nick Brown (voted out, 4-2-1). The Australian Outback, Ep. 10: Two votes, from Elisabeth and Rodger. The Australian Outback, Ep. 11: Four votes, from Tina, Keith, Elisabeth, and Rodger (voted out, 4-2). The Australian Outback, Ep. 14: Voted for Colby Donaldson (who lost, 4-3). All-Stars, Ep. 4: Rob Cesternino (voted out, 4-1). All-Stars, Ep. 9: Jerri Manthey (voted out, 4-1). All-Stars, Ep. 12: Alicia Calaway (voted out, 6-1). All-Stars, Ep. 13: Shii Ann Huang (voted out, 5-1). All-Stars, Ep. 14: Big Tom Buchanan (voted out, 4-1). All-Stars, Ep. 15 (F4 vote): Rupert Boneham (voted out, 3-1). All-Stars, Ep. 15 (F3 vote): Autovote* against Jenna Lewis (voted out 2-1 or 1-0). All-Stars, Ep. 9: One vote, from Jerri. All-Stars, Ep. 10: Two votes, from Kathy and Lex. All-Stars, Ep. 11: Two votes, from Shii Ann and Kathy. All-Stars, Ep. 13: One vote, from Shii Ann. All-Stars, Ep. 15: Received four votes, from Big Tom Buchanan, Shii Ann Huang, Alicia Calaway, and Lex van den Berghe, to win, 4-3. Landed. Let the games begin! Ogakor wins! Time to hug Colby! Yeah, it's weird here now that Mitchell's gone. Early Ep5. With Jerri, checking out the flour supply. Early Ep6. Yay, let's go (not) win some food! Wait... Elisabeth and Alicia are here? Last up, trying to beat Jerri's mark, Ep8 RC (misses by inches). Oh, you're picking *ME* to go with you, Jerri? We should really make sure Colby's still with us. Oh no! Can't drop any more! Picking a partner's name out of Colby's hat for the Ep9 RC. Hoping for Rodger, obviously. Ready to go, final round, Ep9 RC. Eh, Colby and Jerri won. Of course. Oh, look at the coral Colby brought back for us! Reading the Ep9 IC treemail. Trying to knock Elisabeth off her pedestal. Now battling Nick in the semi-finals. I kind of feel bad for Rodger and Elisabeth. Now one of them is going. Oh well. Checking treemail with Elisabeth: Wallets? Sure, you got river water, Amber. But you're also the only one not sick right now. He wants all our tarps? There's a lot of hoping going on. Hope we find food, hope I don't get booted. Early Ep11. This vote is going to be hard. I always hate going to Tribal Council. Bringing her brand-new torch to Probst. Chapera made it to camp! F2 high five! Chapera wins! Everyone hug Rob C! Tatiana Morales at CBSNews.com (5/10/04): "Mending Fences After the Game"
Alex Tresniowski & Tom Gliatto at People.com (5/24/04): "Now That's An Alliance!" "Amber Brkich is from Beaver, Pennsylvania and is a recent graduate from Westminster College, where she earned a B.A. degree in Public Relations, minoring in Speech Communications. Prior to departing for Australia, while Brkich searched for her 'career job,' she was an administrative assistant and lived with her parents. Her previous occupations while attending school included waitress, librarian assistant, swimming instructor, lifeguard and babysitter for her professor. Brkich's favorite hobbies are going out with her friends, dancing and just generally having fun. She's a member of Alpha Gamma Delta Sorority, where she was Vice President and New Member Coordinator. Brkich also belongs to the Catholic Church. Her primary reasons for trying out for Survivor: The Australian Outback include lack of change, excitement, and kangaroos in her life, although the million dollars wouldn't hurt either! Her birth date is August 11, 1978." "Since finishing sixth on Survivor: The Australian Outback, Amber Brkich has enjoyed doing dozens of appearances across the country and has taken part in various charity functions. Immediately following the show, Amber appeared on the cover of Stuff Magazine. For a short time, she also worked as the host of an adventure travel game on Royal Caribbean Cruise Lines. More recently, Amber has appeared in various commercials for Adelphia Cable, Rite Aid drugstores, and Mountaineer Racetrack in West Virginia. In her free time, she enjoys babysitting her niece, Emma, and going out with her friends. Amber remains a resident of her hometown, Beaver, Pennsylvania (a suburb just north of Pittsburgh). She is a graduate of Westminster College, where she earned a Bachelor of Arts Degree in public relations, with a minor in speech communications, in 2000. She is a member of Alpha Gamma Delta Alumni having served as vice president and new member coordinator while still in school. Amber is currently single. Her birth date is August 11, 1978."